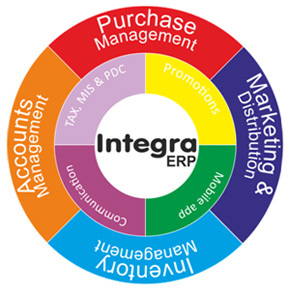 Integra ERP for Wholesalers, Distributors, Super Stockiest, Marketing Companies, C& F Agents etc. Distribution management is a process of creating and developing product distribution network between the source (Producer) and end user (consumer). This process includes, determine distribution area, deployments of staffs, product delivery methodology, distribution channel or supply chain and warehousing. In normal terms a distribution network is a bridge between manufacturer and consumer that carry goods from source location to point of sales (POS), where from the customer purchase the goods. The style and structure of supply chain will vary according to the infrastructure and the business volume of a company. Large companies, particularly dealing with the FMCG and Pharmaceuticals, are found to adopt a number of channels to reach out their goods to customer. But small companies, those who are operating in small area are dealing directly with distributors of wholesalers. The strategy behind choosing a distribution network depends upon the product nature and size, production volume, operational area, management capabilities and frequency of end user consumption.